Prepare grits following package directions. Cook bacon and save the pan drippings. Preheat a skillet until hot. While skillet heats, dredge flounder in your favorite seafood breader. When the pan is hot, add most of the reserved bacon dripping and then the fish. In a separate skillet, heat remaining bacon dripping and add the onion, chopped red pepper and sliced mushrooms. Lightly sauté the mixture then add in chopped garlic, lemon juice and hot sauce to taste. Toss in chopped, cooked bacon. 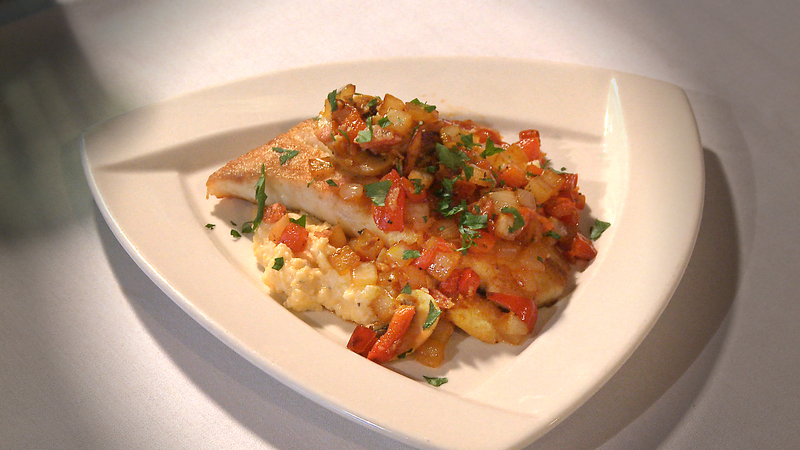 Serve flounder over grits, topped with vegetable mixture. how long to cook the flounder? I’m a big fan of shrimp and grits. This appears to be a very interesting spin on that theme. Flounder being rather thin will cook quickly maybe 3 minutes per side.